Christmas Salad is a delicious salad during the holiday season. It’s loaded with gorgeous winter fruit like pomegranate and juicy pears, and the sweet crunch of candied almonds. 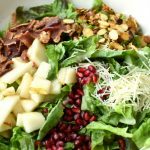 A few years ago my older sister shared this wonderful salad recipe with us, and now it’s our favorite salad this time of year. It’s perfect on Christmas Eve. 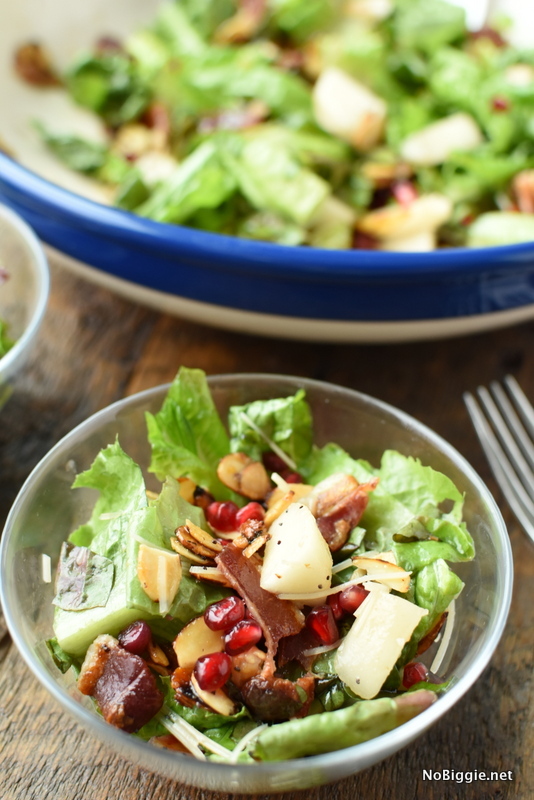 It’s the classic red and green colors of Christmas with the beautiful ruby red gem tones of the pomegranate arils (don’t worry…I had to google that word…it’s the name for the pomegranate seeds), and the pretty mixed greens. We made a quick video so you can see it all come together in a quick minute. There’s something so satisfying about knowing that your salad dressing is homemade. 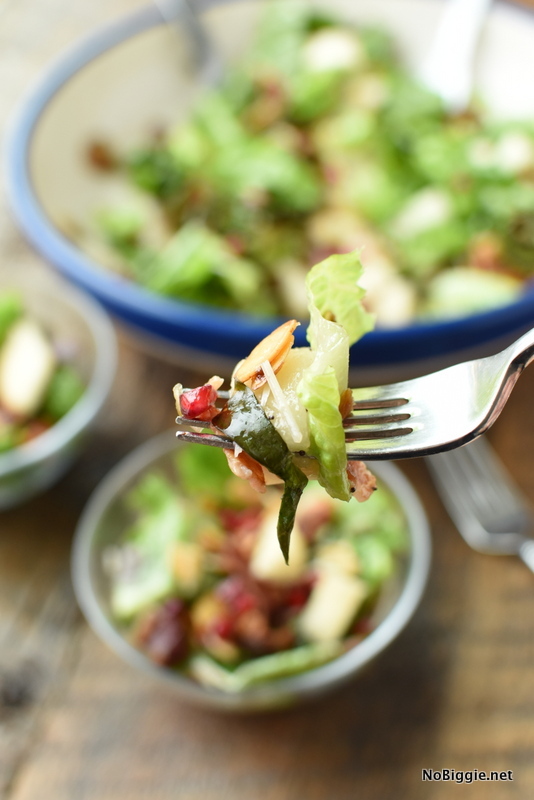 This dressing makes the salad too…it’s sweet and tangy and the perfect match to all the wonderful ingredients. Whenever I toast and candy almonds, I always toast a second batch for my daughter. She thinks they’re the BEST! Plus they make the house smell so good too. 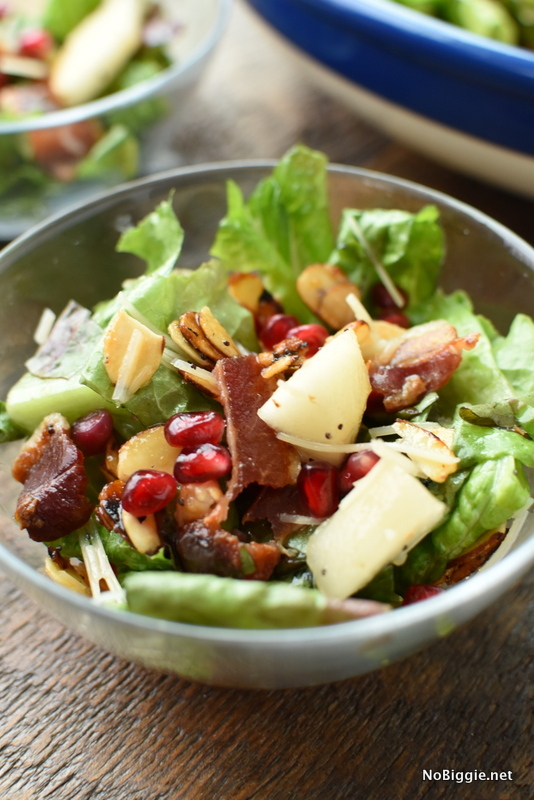 Celebrate the colors and the fruits of the season with this delicious Christmas Salad. It's the perfect salad to go with your Christmas dinner. In a dry hot pan, toast the sliced almonds until lightly browned and fragrant. Add in the 2 tablespoons of sugar and toss until well coated. Remove the almonds from the pan and let cool. The almonds can be stored at room temp in a covered dish until ready to use. Seed the pomegranates in a bowl of water. The seeds will fall to the to bottom and the red and yellow insides will float to the top. Remove the pomegranate seeds from the water and chill in the fridge until ready to use. Make the salad dressing: add all salad dressing ingredients to a bowl and whisk until combined. 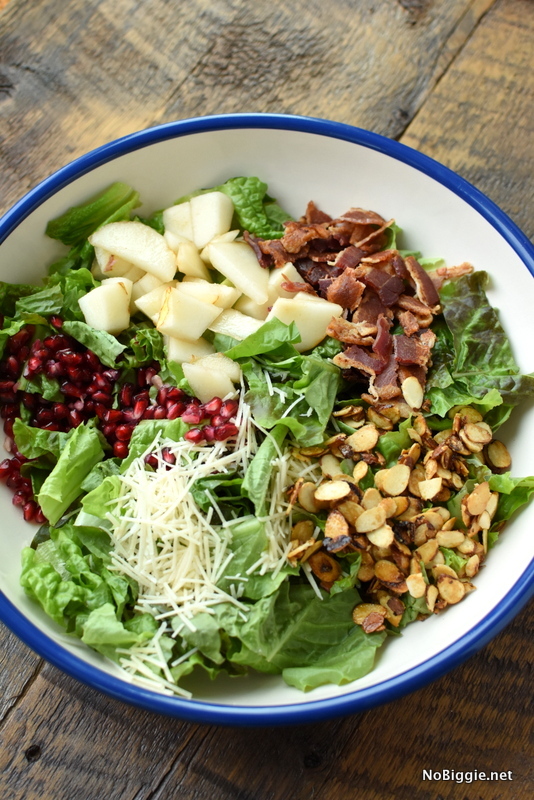 In a large salad bowl add the greens, sliced pears, pomegranate seeds, crumbled bacon, parmesan cheese and toasted candied almonds. 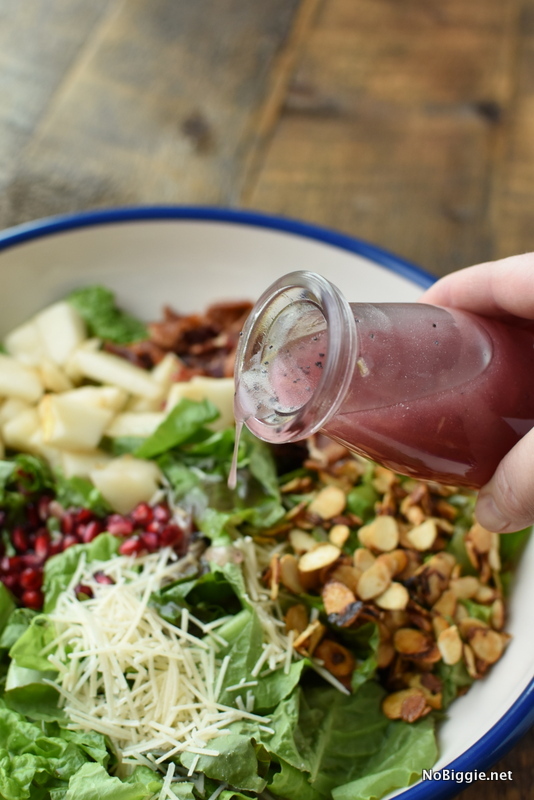 Drizzle and toss the salad with the salad dressing. Serve immediately, and enjoy! De-seeding the pomegranates and toasting the candied almonds can both be prepared ahead of time. 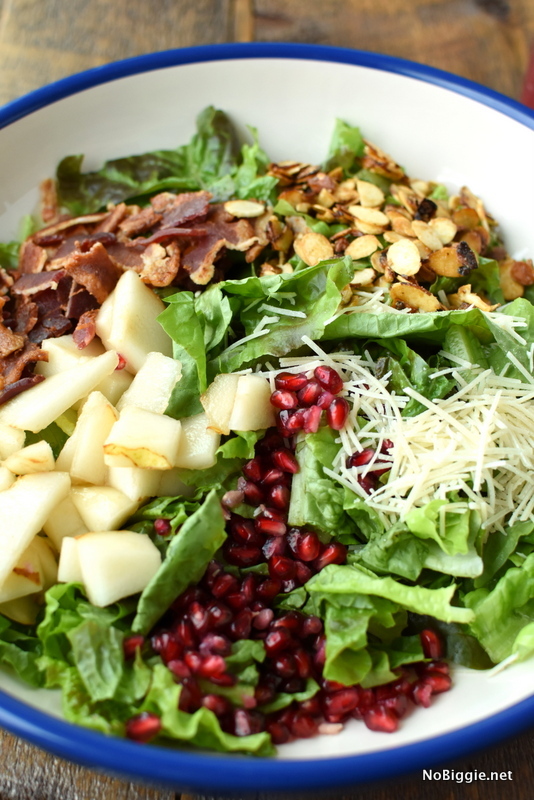 Did I mention this salad has bacon?! I know! We love to cook bacon in the oven…it’s the best way to cook up a bunch! I’d love to know…what is your family’s Classic Christmas Eve dinner? Do you mix it up, or do you always serve the same thing every year? Oh I am making this for Christmas family gathering. It looks delicious. Looks Delish! About how many servings? I am thinking about using it for a progressive dinner. Thank! Hi…I’m not exactly sure. For sure 8 servings. Maybe more depending on the size. I’m doing the same thing, going to make this for a progressive dinner, as I’m the salad house in the line up. Looks delish and festive! Thank you. Hi Elen! How fun! Enjoy your party! As I stated above, I made this salad for a Progressive Dinner (now renamed the Neighborhood Holiday Dinner Crawl) and got rave reviews. This recipe would be plenty for 10 adults. Our dinner had 9 and we had one serving left over. The only thing I changed was adding less sugar to the dressing, specifically using 1/4 cup instead of 1/2 cup. Most recipies are too sweet for me since I’ve weaned myself off of almost all sugar. I taste-tested the dressing first to made sure and it was indeed delicious without the full amount listed on the recipe. Definitely a keeper salad recipe that I’ll make again. Thanks for the tip! So happy to hear it was loved! Merry Christmas! This was such a delicious salad and filling. Never thought about using pomegranates in a salad; I’m hooked. I will definitely make this salad again.